Over the next five weeks, FishDuck.com Feature Writer Caleb Couturie will be analyzing the 25 teams in the NFL Draft that may look to select Marcus Mariota. There is no doubt in the New England Patriots’ organization that Tom Brady is their starting QB. After defeating the Indianapolis Colts in the AFC Championship Game, the heavily-decorated Brady takes his Patriots to his sixth Super Bowl, a number that most people could only dream about. However, there is one caveat: Brady is 37 years old. 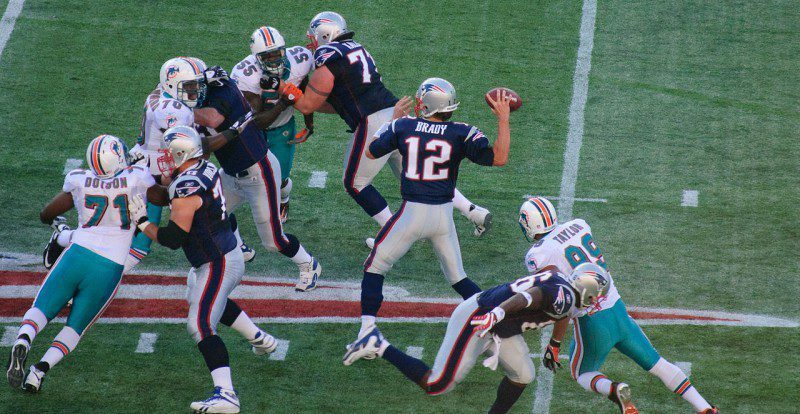 That’s no knock on the Brady, as clearly he is still playing elite football. What it does mean, though, is that the Patriots need to start considering a life after Brady sooner rather than later, and who better than a talent such as Marcus Mariota for Bill Belichick to work with, especially if NE doesn’t believe current backup Jimmy Garoppolo is the future of the franchise. Now what’s important to remember about this project is that we are simply weighing all the teams that at least will take more than a passing look at Mariota as a prospect and what he’s worth. With that said, if NE was totally sold on Mariota, here’s what it would take to get him: NE would have to trade a dependable skill player, such as WR Julian Edelman, 2015 first- and second-round picks and 2016 first-round pick to Tampa Bay for the No. 1 pick. NE doesn’t have a lot of assets; surprisingly, considering how good they are. A lot of their success is directly related to Rob Gronkowski, a player who is absolutely off limits in trade discussions. Outside of Edelman, the Patriots don’t have a lot of players worth a substantial trade. Luckily for NE, Edelman and two extra draft picks should be enough for TB to give up its pick in 2015. Edelman, lined up in the slot with Mike Evans and Vincent Jackson on the outside, could help create one of the deadliest receiving cores in the NFL. With NE’s pick, TB could also likely take FSU’s Nick O’Leary and completely revamp the offense. Building a solid receiving corps, and giving them a year to develop, could really help TB in 2016 if they decided to take a franchise QB in 2016 instead. For NE, giving up Edelman hurts but they’d certainly overcome as they always seem to do. Mariota is a special talent, and there’s no doubt that Belichick sees that. Belichick is used to working with prospects who came in with a cloud of doubt surrounding them (see Brady, Tom- taken in the sixth round). Although Mariota doesn’t fit the Pats’ scheme now, there’s no doubt Belichick’s genius could devise a scheme that played to the QB’s strengths. Also, although it’s only hypothetical, the thought of Mariota on a rollout with the option to either run or throw to Gronk is pretty tantalizing. The last thing to consider is the relationship above Mariota – Belichick and former Oregon Ducks HC and current Philadelphia Eagles HC Chip Kelly are close friends. Belichick devised the majority of the Patriots up-tempo schemes after multiple film room and in-person visits with Kelly while Kelly was at Oregon. Besides the cold, Mariota should do just fine. Brady would be an excellent QB to learn and grow under, and with the dynasty that Belichick built there, Mariota should have no problem attracting other players to join him out in NE. Besides Belichick and Brady, though, the biggest seller is the opportunity to work with Gronk. There is absolutely no better safety blanket in the NFL than Gronk, as the 6’6″ 265 lb. TE will catch almost anything thrown his way. That kind of talent is valuable for young QBs, especially those such as Mariota, who will have to adjust his game when he shifts to the pro level. The day Brady retires, yes. Until then, it’s riding the bench and just trying to learn as much as he can before it’s his time to shine. While most franchise QB’s don’t sit anymore, Championship teams aren’t afraid of long term investments, such as Aaron Rodgers in Green Bay, Brady in NE, and Steve Young in San Francisco.